The autonomous underwater vehicle (AUV) Gulper being deployed on the R/V Rachel Carson in 2012. 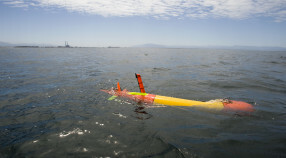 MBARI began developing unmanned and untethered vehicles, called autonomous underwater vehicles (AUVs) as a way to take the high personnel costs out of scientific sampling of the ocean. These platforms are low cost as compared to ships but can nevertheless be directed as to where, when, and what they sample to full ocean depth. Knowing that there would be demand for diverse payloads, MBARI engineers created a modular vehicle that can be quickly reconfigured to host a number of payloads without modifying basic components such as the propulsion, navigation, power, control, and emergency location systems. AUVs are programmed at the surface, then navigate through the water on their own, collecting data as they go. 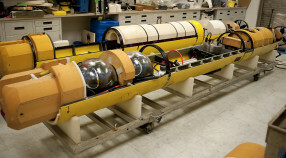 MBARI AUVs can measure physical characteristics of the water, such as temperature, salinity, and dissolved oxygen, detect chlorophyll from microscopic marine algae, and measure concentrations of small particles in the water, map the seafloor and collect images of the seafloor and the midwater. The actual and potential range of applications of AUVs for ocean science is large. As their range of deployable science instruments increase and their operating costs decrease, AUVs are likely to become ubiquitous tools for ocean exploration and sampling. 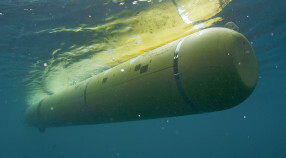 AUVs are an increasingly important tool for oceanographic research. They routinely and cost-effectively sample the water column at depths far beyond what humans are capable of visiting. The Dorado-class AUVs are torpedo shaped, 53.3 centimeters (21 inches) in diameter and can be as short as 2.4 meters (8 feet) or as long as 6.4 meters (21 feet) and driven by a single propeller. Vehicle control is achieved by articulating the propeller in the round duct surrounding it. 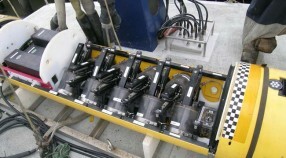 The first Dorado was operated in late 2001 to measure the inflow of water into the Arctic basin through the Fram Straits and provided the basic template for MBARI Dorado -class AUVs. Systems currently operational at MBARI include the upper-water-column vehicle, in routine operations since 2002; the seafloor mapping AUV, which accomplished its first deep mapping operations in 2006; and the imaging AUV. The core vehicle elements are deep-rated (the mapping AUV is 6,000 meters rated) and have been operated as long as 20 hours. The Tethys AUV, also called the long-range AUV, is a new AUV designed to operate over longer ranges than its larger cousin. Tethys is 30.5 cm (12 inches) in diameter, 230 cm (7.5 feet) long, and weighs 120 kg. The vehicle can support an 8 W sensor payload for distances in excess of 1000 km at 1 m/s. Operating at a speed of 0.5 m/s with minimal sensors allows ranges of several thousand kilometers. In addition, by way of a buoyancy engine, the vehicle is capable of trimming to neutral buoyancy and drifting in a low power mode. The vehicle is designed to be simple enough for operations by individual PI laboratories. Tethys provides capabilities falling between existing propeller driven vehicles, which typically have endurances on the order of a day, and buoyancy-driven vehicles (gliders) that can operate for many months.